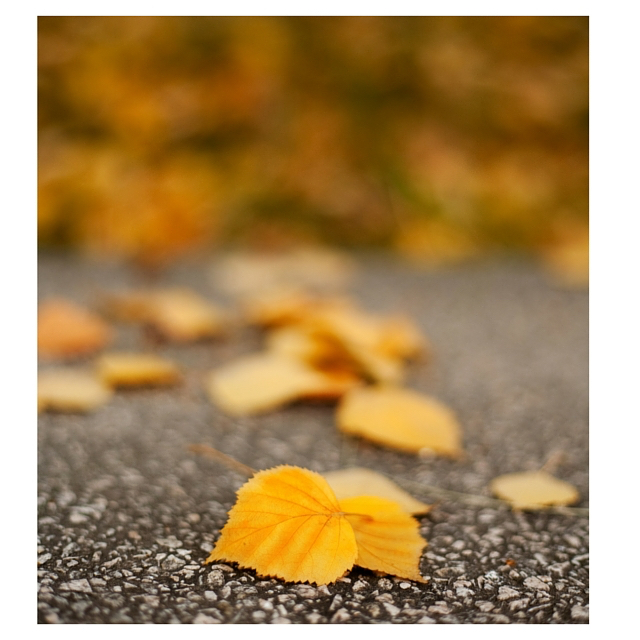 While the autumn can have amazingly sunny but slightly crisp days, sometimes there is a winter chill in the air one day and then summer sun and blue skies the next. Planning what to cook can inevitably lead to barbecues in the rain or the oven blaring when it its already a furnace indoors. Arista is a great dish whatever the weather as it is perfect both hot and at room temperature. Arista is a 15th century Tuscan dish consisting of a pork loin, partially separated from the ribs, and roasted with garlic, rosemary and sage. Often potatoes are added to the roasting pan. 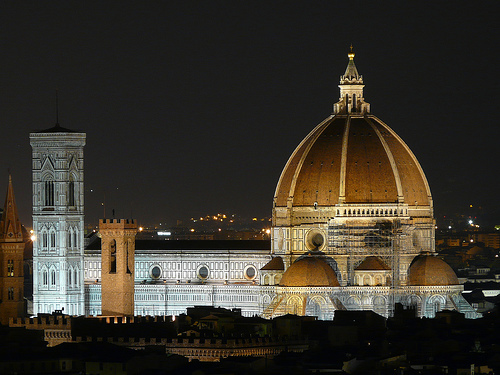 The name “arista” is Greek for “the best”and legend has it that the Greek Cardinal Basilio Bessarione while visiting Florence (Firenze), upon tasting the dish declared it to be “arista” (the best) and the name stuck. 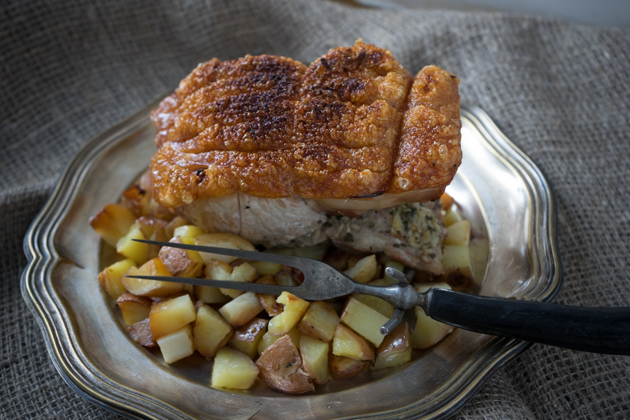 The combination of the crispy, salty crackling with the juicy, tender perfumed meat melds with the potatoes which have soaked up the delicious juices. If the weather report predicts hot weather for the next day, just cook it the night before and serve it at room temperature dressed simply with olive oil and lemon juice. If you like, you can add 3 finely chopped sage leaves or a small spoonful of ground fennel seeds to the rosemary and garlic mixture. For illustrated step-by-step instructions, click here. 1. Score the skin of the pork and rub it with 5 grams of salt, ensuring the salt gets into the cut part of the skin. Leave the roast in the refrigerator overnight, uncovered. 2. Preheat the oven to 180C (350F). Partially cut the ribs away from the bone, leaving it attached at the thicker end. 3. Mix together the garlic and rosemary with 7.5 grams (1 1/2 teaspoon) salt and 5 grams (1 teaspoon) black pepper. Rub the area between the bones and the loin with the garlic and rosemary mixture. 4. Use kitchen twine to tie the roast back together so that it does not separate while cooking. 5. Rub the rest of the meat (but not the skin) with the olive oil and salt and pepper. Place the roast bones down and skin up in a large, heavy-bottomed pot such as a Dutch oven or clay pot. Pour the white wine in the bottom of the pan. Place in the oven for 30 minutes uncovered. Add the potatoes and continue to cook for another 30 minutes or until a thermometer in the centre of the roast registers 65C (150F). 6. Turn the oven up to 225C (450F) and cook until the skin is crisp and crunchy and a thermometer inserted in the centre of the pork roast registers 75C (165F). 5. Remove from the heat and allow the roast to relax for 15 minutes before slicing. Check the potatoes to see if they need more salt or pepper. Slice and serve with the beans.